Does anyone else do this? Do you take pics with your phone so that you can remember things? I now take pictures to remind me of gifts I want to give or get, flyers of events I want to go to, and steps of processes I am afraid I am going to forget. 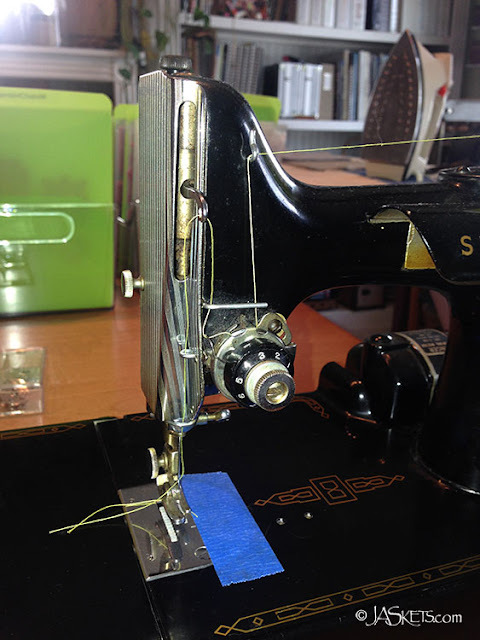 So when it came time to change the thread color on my rarely-used vintage sewing machine I FINALLY stopped to take a picture first so I would know how to re-thread the damn thing. Ever other time I would look at the path and think, "OK, this is simple I can do it again," only to have absolutely no recollection of all the dips and doodles. Of course, now that I have actually taken the reference photo I will probably be able to remember now, but at least I have it, when 6 months from now I need to do this all over again. If you are like me, you like looking at all of the great ideas on Pinterest. Unfortunately many times it seems like the projects are completely impractical or worst, aren't even projects at all and just links to Google images so there are no instructions or any additional information. This idea of using a restaurant style cheese shaker (or sugar dispenser) as a twine holder was actually one that needed no further instructions to make. 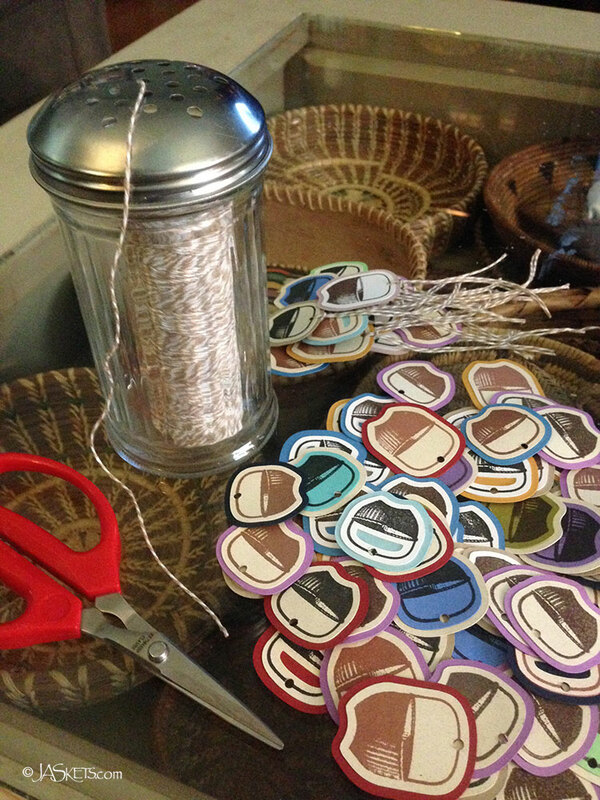 I like using butcher's twine in my card making or for making tags, but between the cat going absolutely bonkers and the spool shooting across the table, I find it can be a test of one's patience. I had been on the lookout for one of these vintage restaurant wares for the last year, but had never run across one. I hit the jackpot earlier this summer when I found not only this cheese shaker, but also a sugar dispenser as well. Both looked like they had never even been used before. While my big cone of red and while baker's twine won't fit (until I use up more of it), my other spools fit perfectly and keep the spool on the table and away from playful kittens. It made sitting in front of the TV tying strings to tags a pretty easy task. It also doesn't hurt that they look cool hold the twine too. As you may have seen in my previous post, I am hosting a workshop with JoAnn Kelly Catsos this fall where we will be making mini Shaker utility basket. Many of the baskets the Shaker used in their communities were lined with fabric or even leather. The Shakers were fixated on cleanliness so a liner in a wood chip basket for example would keep the mess from small kindling contained and off the floor. So, being the crazy person I am I decided that the little baskets we will be making needed to have little liners to match. The first challenge was to find fabric with a pattern the correct scale. I have lined some of my full-sized baskets with pillow/mattress ticking, so wanted to find something that would look like that. After wondering around the fabric store for a while and getting some confused looks from the sales clerks when I tried to describe what it was that I was looking for, I found some striped denim that looked promising. Thank goodness for Project Runway as I have watched how the designers drape and fit their clothes to the mannequin. Really, I used what I learned from a reality TV show to help me with my crafts! 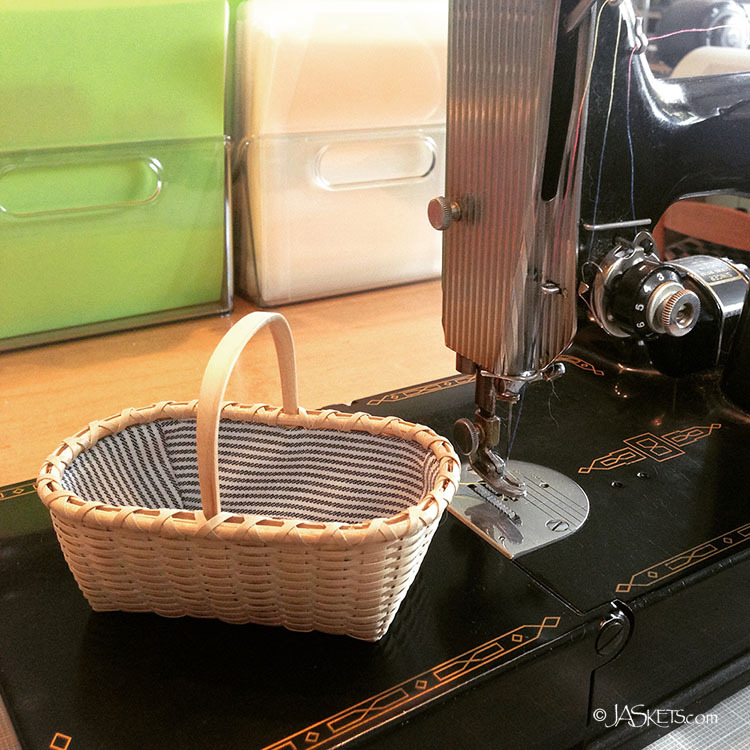 After cutting and sewing and prototype, and fitting to the basket, I was able to make a pattern so I could make more. My goal is to make these to offer as an option for the participants in the workshop. I am sending a couple samples to JoAnn to make sure they fit the baskets and if that goes well then I will start sewing away.